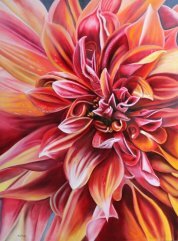 How to Paint Flowers like you mean it! 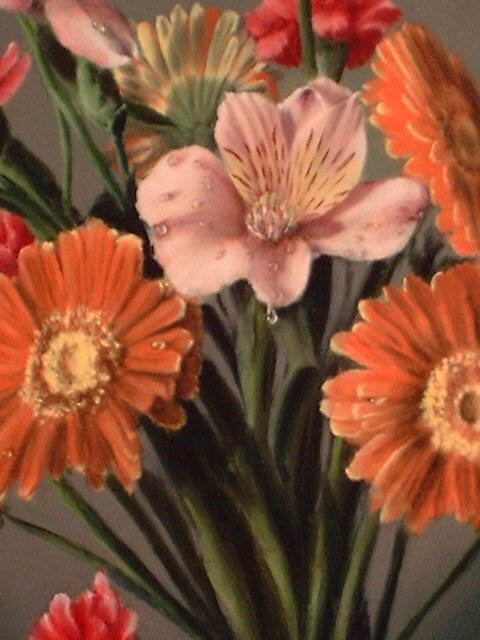 How to paint flowers in oils, realistically, step by step. Several demonstrations are discussed here with starting from the basics, to tackling a complex blossom. 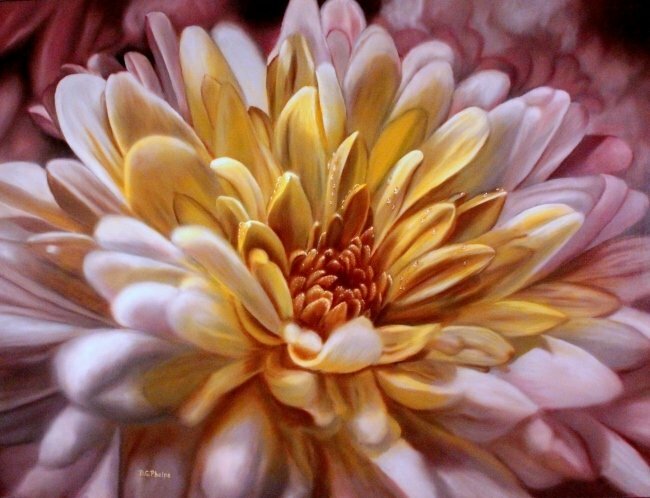 How to paint a dahlia, a rose, even a southern magnolia are included. Most with video clips of the processes I use to created them. So now, you've gone out and bought a huge fresh bouquet from your favorite florist. You’re really pumped up and excited about these flowers to paint, your excitement builds at a steady pace. You get home, you cut off their ends under water, place them in the vase and head out to the studio. but then suddenly, you freeze. All these flowers, all these petals, all these stems and leaves, oh no! Relax, it’s just a story.... But it's my story too. I can't tell you how many times I've done just what I've described and simply brought the vase full of flowers back upstairs to allow my wife to enjoy them. The anxiety of attempting a full bouquet just got to me. As time has gone by, I've learned to use a systematic approach at painting, and I use a few tools that help me produce works that amaze me even today after painting them since the mid 70's! In this section of the site, I'll explain some of my methods, and demonstrate on several different flowers. So lets get started, and don’t worry about the bouquet, just keep that water mister close by and every few minutes give ‘em a good spray. 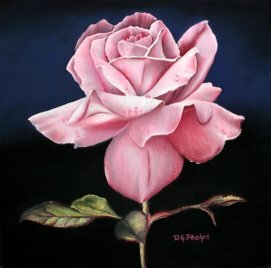 Also, as you can see with some of the above images, I LOVE painting flowers. Of all the subjects I do paint, these hold a special place in my heart. Get out that plastic composition template I told you about here Composition Template and get a rough estimate of where your main blossoms are gonna be. Select 1 or 3 to be your main focal point. Get out your digital camera and get to clicking. Taking shots from above the table edge, straight on to the table edge, and below the table edge. Then readjust your lighting from the ¾ position (3/4 of subject illuminated from the left) to a position almost at 90 degrees to the subject on the left. Again taking pictures from the top side, and lowering your camera until you’re below the table edge. 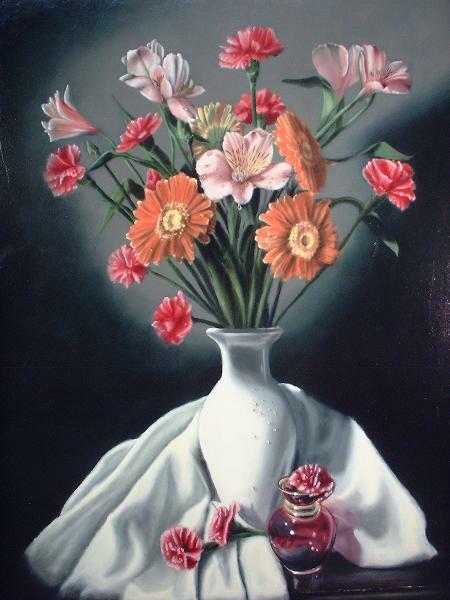 Now for a more in-depth view of flower arrangement for your painting, click here, it opens in a new window so you wont lose your place here. Finally, move your lighting to illuminate from above the flowers (straight overhead) and shoot several shots. This will give you a total of at least 9 perfectly great paintings within your camera! From here, you will follow the Flemish Technique to complete your painting. Remember, you start with your pencil drawing, then the ink overlay. The imprimatura (toning the canvas), umber under-layers, the color layers, and finishing layer. 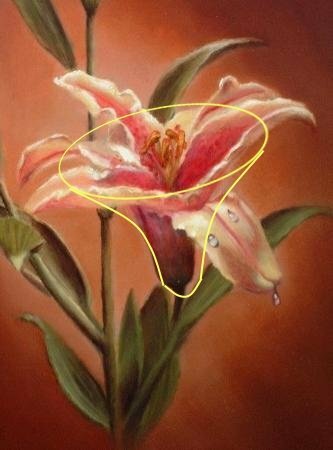 Having said all that, lets discuss some basics on how to paint flowers rules for you to think about before you really get started. The image below shows the brown under painting, with the gray under painting about half way finished. In this composition, I wanted to mirror the flow of the drape with the spot light on the back wall. A little closeup of the dead layer or gray under painting. No texture, just some details and modeling of the petals and leaves. 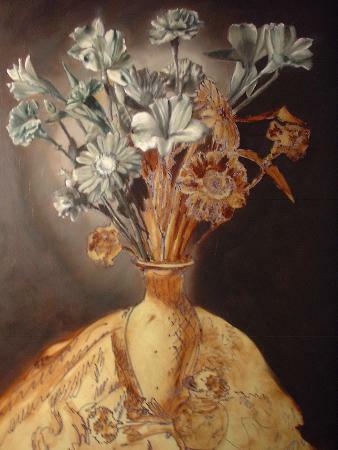 A completed bouquet of flowers using the flemish technique. Learn to see the underlying structure of your flowers. Continue to arrange them into something pleasing to you and that conforms to your “golden rule” template. Going back to these basic underlying structures, learning how to paint flowers can be kept simple. Most flowers will usually conform to these 4 basic shapes! The disk shaped, like the Daisy. Just remember a tea saucer that is round and the petals will radiate from the center of the saucer. When viewed on an angle, the saucer then becomes elliptical. An exception to this rule would be the closed or early partially opened disk-shaped blossom. It will tend to be coned shaped. The cone-shaped flower. Blossoms that grow on a long, single stem, (like Lilies, Lilacs, Hyacinths) are conical in shape. Some flowers have many mini-blossoms that are cone shaped but their entire mass combined will form a sphere. Sphere-shaped, these are my favorites, why? Because the rose is part of this group, as are peonies, carnations and hydrangeas. When viewing these blossoms, most will have a multitude of petals (each an individual treasure) but their collective groupings will form a beautiful sphere. Lots of artists are afraid to attempt them, but stick with me for some tricks to make them a little more easy. Your largest group will be the combination shape (combination of the 1st three shapes in one single flower). Lets look at the Daffodil. The daffodil has elements of the disk shape at its base, and the inverted cone shape protruding out of the base like a trumpet. All in one bloom! I've got more information here on how to paint a daffodil. It goes into much more details about what to look for in this complex blossom. Just click the picture too, to get there. 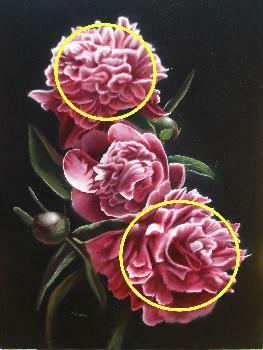 Then hit your browsers back button to finish this part of "how to paint flowers" lesson. So, from here on out, don’t just look at your flowers as a mass of petals, veins, and color. Break it down to its fundamental shapes, (disks, cones, spheres or a combination). This is super important when it comes to shadows, half shadows, and basic modeling of the flower. Think of the blossom in its basic geometric form having a three dimensional depth and it will remove some of that fear to tackle these babies. Learning how to paint flowers just isn't that difficult anymore! Oh, I've got another shape, that of the tea cup to add to this group. 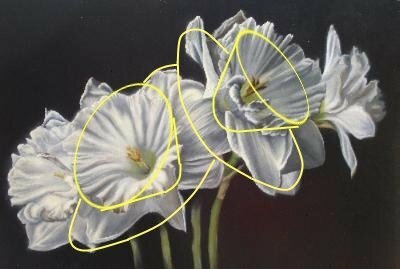 Check out the explanation concerning how to paint a tulip. Speaking of three dimensional, let’s talk a little about form, Illusionist Form. Visit here for how to make something look 3 dimensional on a canvas. It talks in more detail how to get a more detailed picture of what we are explaining. Just remember, within each of these shapes there will be form. Each blossom will have its’ own individual highlight, main light, half shadow, shadow, reflection, cast shadow. Each of these items are discussed in detail in my elementary art lessons page. Let’s talk about the bouquet as a whole now. Flowers in the back of the arrangement will have less intensity, more grey, less focus and sharpness. Flowers at the front of the arrangement will have more color, intensity and sharpness. Your focal blossoms will have the highest color intensity, sharpness and details. So don’t sweat trying to copy each and every petals on those back blossoms, they need to recede into the back of the picture plain anyway. Those backward facing blossoms in the rear of the bouquet are painted with very soft edges to simulate being out of focus. My eBook talks a lot about hard and soft edges and what it does for a realistic painting. 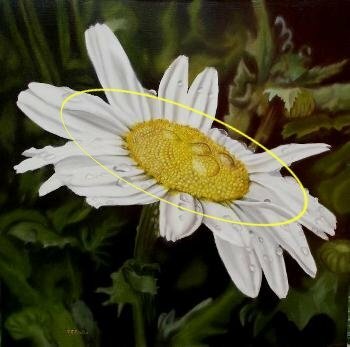 There's a lot of technique involved in an oil painting, if you are interested in learning this special way in creating realism then click below. My eBook takes you thru all the steps to create a painting like the one below. How to paint flemish style, Click Me! Some flowers just plain got a lot of fine details (carnations) so to get around some of that, select only about a 1 inch square of the blossom and get that right on, then allow for a slight blur to the rest. The human brain will fill in the blanks and your viewer will still understand what you are depicting. 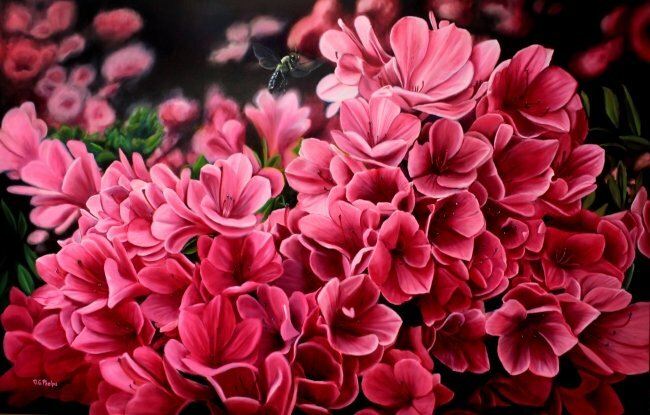 Hopefully, with this lesson on how to paint flowers, you now have a few tools in your bag to tackle the task of a full bouquet of flowers for your next painting project. 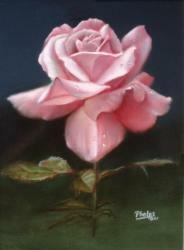 Interested in a bit more concerning flower painting and flower arranging with a artistic eye. Click here for more info on this subject from a great site created by the publishers Artists Magazine! Just remember, break it down to small steps. Visualize the basic geometric shapes of the blossoms. Stick to the rules of depicting form within each of those blossoms. 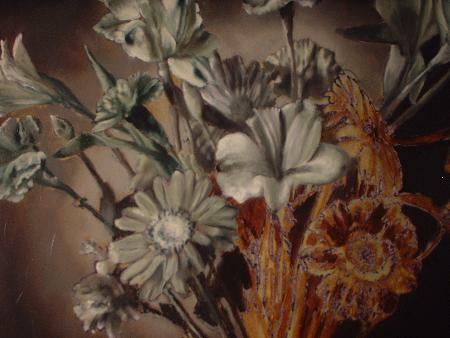 Use the Flemish technique, and you too will know how to paint flowers like you mean it! 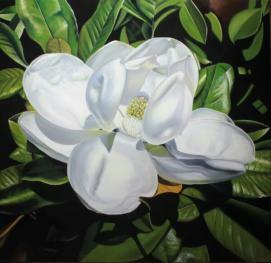 Come watch me paint this huge 5 foot square Southern Magnolia blossom. Video included. One of my most popular paintings, Wet and Wild Dalhlia. Come watch me paint this large 30"x40" canvas. Video link below! Do watch it in "HD" mode full screen to get in close for the brush work. The "Dusty Pink" hybrid rose. A commissioned work. I show it step by step, with video too! How to paint a Dahlia. A yellow and red rose.